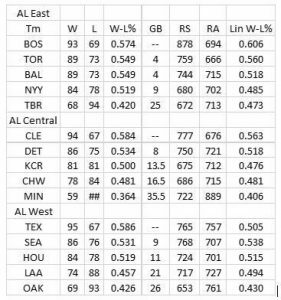 The table below shows for each of the AL teams their actual 2016 winning percentages (W-L%) along with their expected winning percentages (Lin W-L%), calculated using my linear formula Lin W-L% =.000579*(RS – RA) +.50, RS is runs scored and RA is runs allowed. My choice to win the AL East is the Boston Red Sox. Yes, the Red Sox lost David Ortiz and his 38-home run 2016 season. But, kudos to the Red Sox management for acquiring Chris Sale. Sale will join defending American League Cy Young Award winner Rick Porcello and David Price (if healthy) to give Boston a front-of-the-rotation combination that potentially could be the best in the Major Leagues. Sale hasn’t won his own Cy Young Award, but he has finished in the top six in AL balloting each of the past five years. Two other notable moves included the signing of free-agent first baseman Mitch Moreland to upgrade the infield defense and trading for Tyler Thornburg, who will serve as a setup man for Craig Kimbrel. Offensively, no one expects Moreland to replace Ortiz. However, Moreland taking over first base will allow the Red Sox to shift Hanley Ramirez into the DH role and that improved overall defense does help close the value gap between Moreland and Ortiz. Sorting out the No. 4 and 5 starter spots between Drew Pomeranz, Steven Wright and Eduardo Rodriguez is a problem every team would love to have. 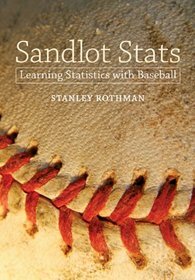 I believe the Red Sox are the most improved team in the AL and will improve on their 2016 AL best Lin W-L% of 0.606 increasing their win total to over 95 wins. My choice for the AL Central is the Cleveland Indians. The starting pitching should be improved over last year with the return of Carlos Carrasco and Danny Salazar to full-time duty fortifying a rotation fronted by Corey Kluber. Adding Andrew Miller as their closer to go along with Cody Allen will improve an already excellent bullpen. The signing of Edwin Encarnacion, Austin Jackson, and Chris Colabello will create more runs for the offense. With strong starters and an improved bullpen and offense, the Indians should increase their Lin W-L% to about 0.585 which would put their win total at 95 and make them a runaway winner of the Central Division. In my opinion the AL East and AL Central have clear cut winners in the Red Sox and Indians. However, the AL West is not so clear cut. In 2016, The Texas Rangers won the division with a W-L% of 0.586. However, their Lin W-L% was only 0.505. The reason for this discrepancy is they won 36 of 47 1-run games. This will not happen again in 2017. So, I have eliminated Texas as a winner. This leaves me with the Seattle Mariners and Houston Astros as my two choices. Both these teams have made notable additions. For Seattle, Jean Segura and Jarrod Dyson will give them a great one-two punch at the top of the lineup setting the table for a trio of 30-homer sluggers Robinson Cano, Nelson Cruz, and Kyle Seager. For Houston, Carlos Beltran, Brian McCann, and Josh Reddick will join an offense that already featured Jose Altuve, Carlos Correa and George Springer, giving Houston an offense that potentially stacks up to any in baseball. Seattle should improve their Lin W-L% to about 0.550 and Houston should improve their Lin W-L% from 0.515 to 0.535. Whichever pitching staff does better will determine the winner. My choice is Seattle based on my belief that King Felix Hernandez, who turns 31 in April, after a shaky 2016 will return to his throne in 2017. To summarize, my 3 divisional winners are Boston, Cleveland and Seattle and my two Wild Card teams are Houston and Toronto. Finally, the team that will represent the AL in the 2017 WS is the Boston Red Sox.